MITOGEN-ACTIVATED PROTEIN KINASE 3 (MPK3) is a mitogen-activated kinase whose mRNA levels increase in response to touch, cold, salinity stress and chitin oligomers. MPK3 is involved in oxidative stress-mediated signaling cascade (such as ozone). MPK3 is also involved in the innate immune MAP kinase signaling cascade (MEKK1, MKK4/MKK5 and MPK3/MPK6) downstream of bacterial flagellin receptor FLS2. MPK3 may be involved in hypersensitive response (HR)-mediated signaling cascade. MPK3 may phosphorylate regulators of WRKY transcription factors. MPK3 mediates the phosphorylation of VIP1 and subsequent stress genes transcription in response to Agrobacterium. MKK9-MPK3/MPK6 module phosphorylates and activates EIN3, leading to the promotion of EIN3-mediated transcription in ethylene signaling. MPK3/MPK6 cascade regulates camalexin synthesis through transcriptional regulation of the biosynthetic genes after pathogen infection. YDA-MKK4/MKK5-MPK3/MPK6 module regulates stomatal cell fate before the guard mother cell (GMC) is specified. This MAPK cascade also functions downstream of the ER receptor in regulating coordinated local cell proliferation, which shapes the morphology of plant organs. Rabbit polyclonal antibodies were produced by immunizing animals with a GST-fusion protein containing the N-terminal region of arabidopsis thaliana MPK3 (At3g45640). Antibodies were purified by affinity purification using immunogen. Fig 1. 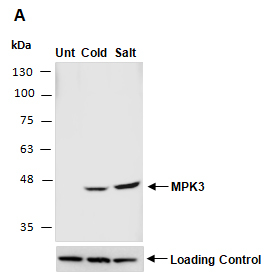 Western blot analysis of equal amounts of protein extracts from wild type arabidopsis leaves untreated (Unt) or treated with cold stress at 4 degrees for 5 hrs (Cold) or subjected to high salt stress by growing at 250mM NaCl for 20 hrs (Salt), using anti-MPK3(N) (R3409-1) at RT for 2 hr.